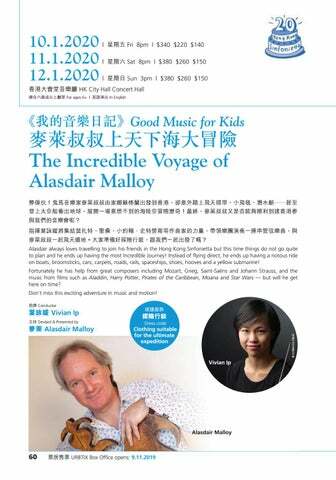 麥萊叔叔上天下海大冒險 The Incredible Voyage of Alasdair Malloy 弊傢伙！鬼馬音樂家麥萊叔叔由家鄉蘇格蘭出發到香港，卻意外踏上飛天掃帚、小飛毯、潛水艇⋯⋯甚至 登上太空船衝出地球，展開一場意想不到的海陸空冒險歷奇！最終，麥萊叔叔又是否能夠順利到達香港參 與我們的音樂會呢？ 指揮葉詠媛將集結莫扎特、聖桑、小約翰．史特勞斯等作曲家的力量，帶領樂團演奏一連串管弦樂曲，與 麥萊叔叔一起飛天遁地。大家準備好探險行裝，跟我們一起出發了嗎？ Alasdair always loves travelling to join his friends in the Hong Kong Sinfonietta but this time things do not go quite to plan and he ends up having the most Incredible Journey! Instead of flying direct, he ends up having a riotous ride on boats, broomsticks, cars, carpets, roads, rails, spaceships, shoes, hooves and a yellow submarine! Fortunately he has help from great composers including Mozart, Grieg, Saint-Saëns and Johann Strauss, and the music from films such as Aladdin, Harry Potter, Pirates of the Caribbean, Moana and Star Wars — but will he get here on time? Don’t miss this exciting adventure in music and motion!